A few weeks back hubby bought home a 12 pack of mini Cokes in the groceries. These little 300ml bottles are just so cute, I knew I had to do something with them. Then it hit me, sensory play for Master J! 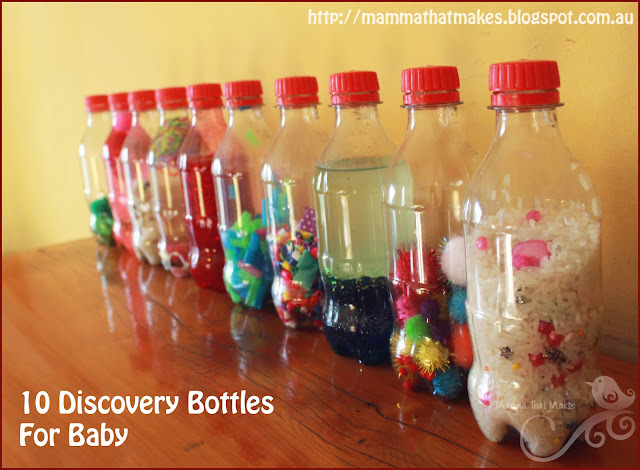 The bottles are lightweight and sturdy and little hands can easily grab them. The girls and I made 10 of them. We used a combination of light non water materials for when Master J is having floor time (to minimise clonks to the head, because lets face it, babies are clumsy) and some heavier liquid filled ones that the girls want to use with him while he is sitting upright. I am happy to report that so far these have been a HUGE hit with all 4 kids. Miss C, my special needs gal, especially loves the liquid ones, they seem to calm her when she gets anxious, and of course Master J thinks they are all just fantastic. He gets to explore all these tiny fun looking items, without the choking hazard. We can't wait to make some more! So below are the 10 we made, with their "ingredient" lists. I hot glued the caps on all of the bottles, even the non liquid ones, to make sure they stay shut. Be sure you have everything you want in the bottles before sealing them, because trust me, once the caps are glued on, they stay put! 1: The green bottle. This bottle has all things green. Pompoms, buttons, beads, sequins, bows, letters, mini craft sticks, loom bands and a cut up straw, no water. It makes fun sounds when you shake it. 2: Pink pompom bottle. This one has various size and textured pink pompoms and was filled with water. 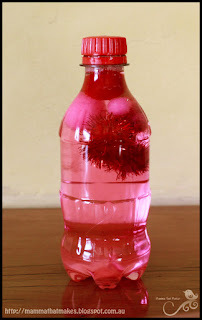 Some of the pink dye ran from the glittery pompom and tinted the water. 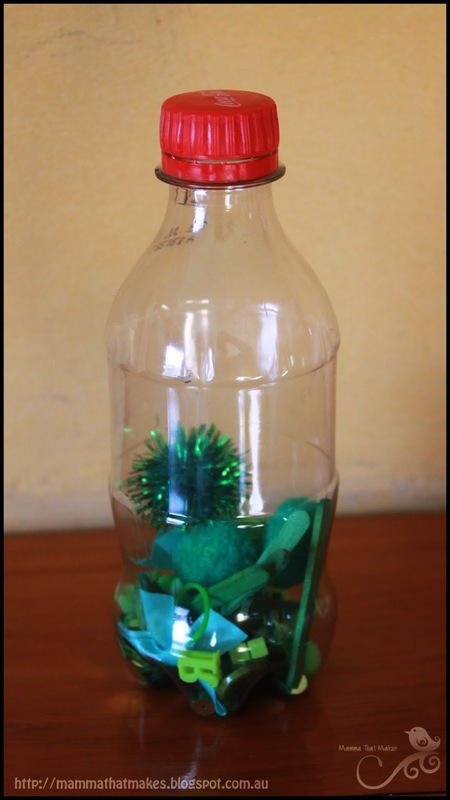 The pompoms float to the top gently, its a nice calming bottle. 3: Seashell bottle. This one has no water. 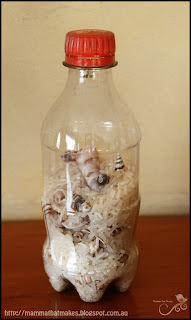 Instead we put in some shells the girls had collected on our last trip to St Helens (a mix of tiny and 'it will only just fit in the top') and some rice. Its such a pretty bottle and one of my favourites. It just screams summer. Master J loves the sound it makes. 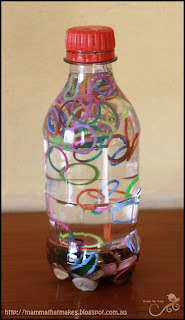 4: Bands and buttons bottle. 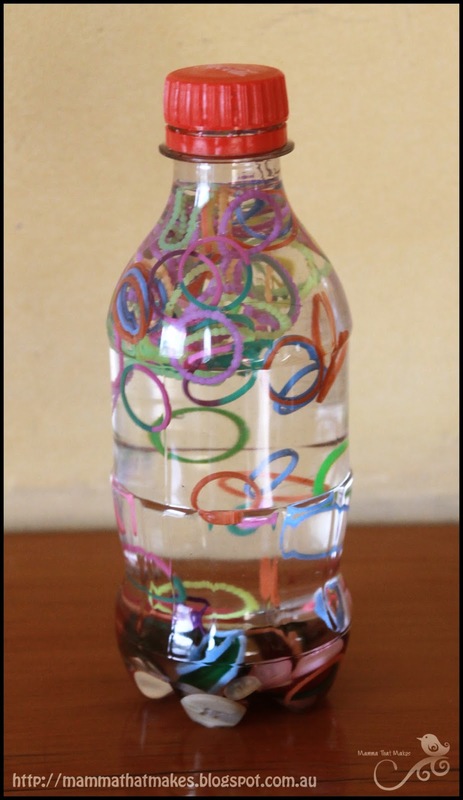 This bottle has some loom bands (left over from the short lived craze) and some buttons and filled with water. The buttons sink, the bands float. 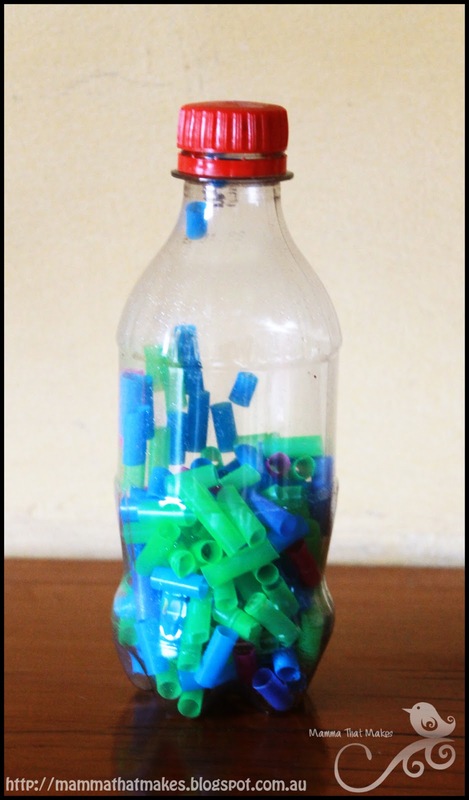 The kids enjoy watching the pieces swap places when they turn the bottle and the buttons make a soft clinking sound when they touch down. 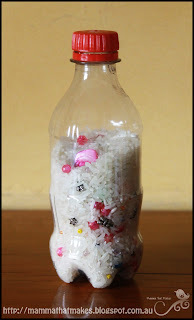 5: Beads and rice. This bottle is simple, yet pretty. 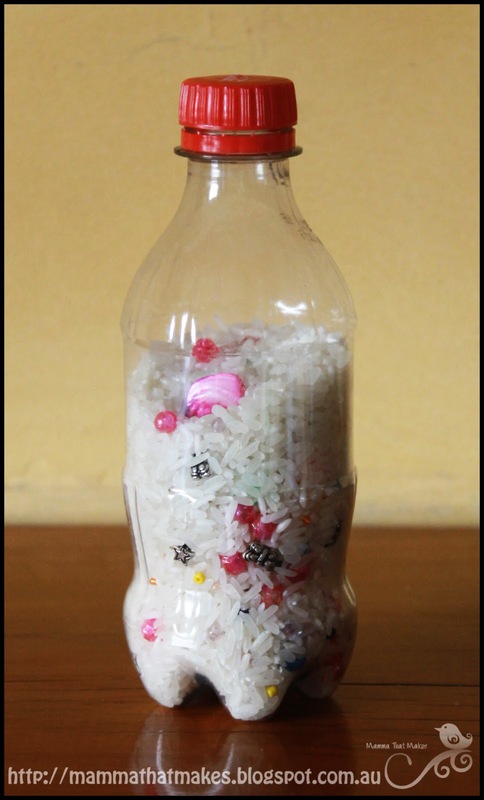 It has a bunch of beads in various sizes, shapes and colours and then 3/4 full of plain white rice. Not only does this one make a fun sound but the girls like seeing how many different beads they can see in there. 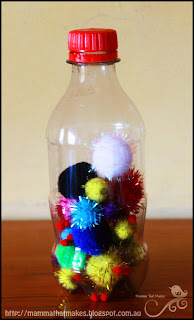 6: Pompom bottle. This bottle has a bunch of pompoms. All different sizes and colours. This is one of the lightest bottles and while it doesn't make much sound, Master J loves rolling it around in his hand as the pompoms gently fall about. 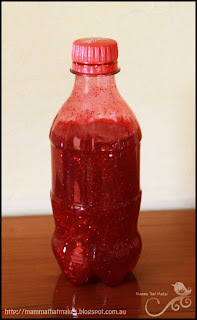 7: Glitter goop. This bottle looks kinda gross, but Miss M thinks its the best! We just used a half bottle of red glitter glue, a few drops of red food colouring to make it brighter and some warm water to help break the glue up. 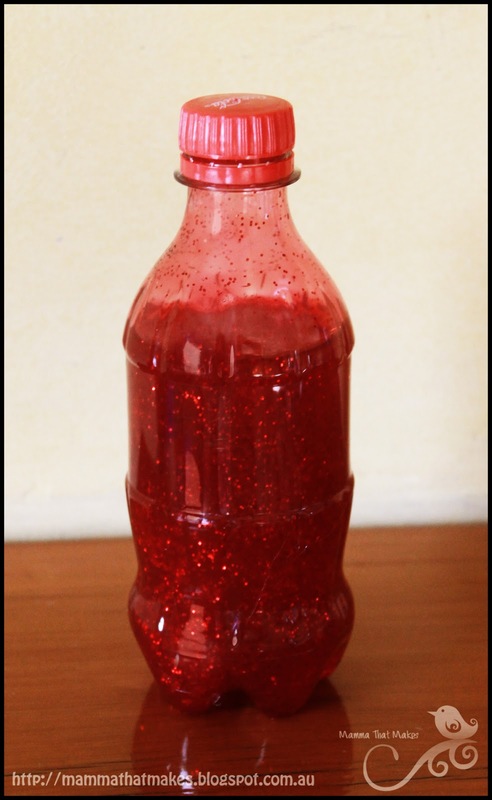 If I made this again I'd add some heavier glitter, the stuff in there just hangs about where it is, rather then floating or sinking but it has some beautiful colours, especially when held to the light. 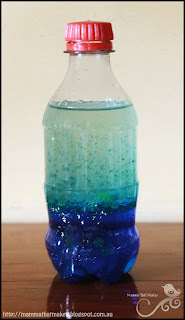 8: The earth bottle. 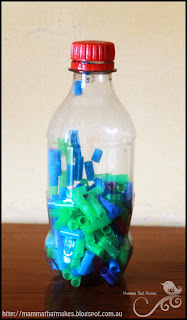 The girls have dubbed this one the earth bottle because it is just green and blue straws all cut up. Master J loves this one, its light and it makes an impressive sound when he waves it around. 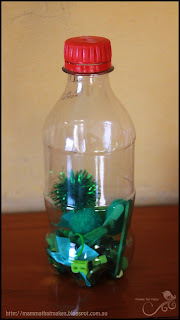 9: Treasure Bottle. 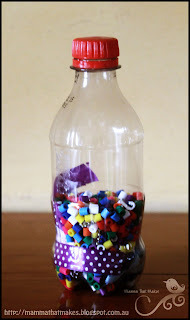 This bottle has a whole bunch of leftover beads the girls had (I *think* they are the ones you heat to make stick together) then we put in some treasures. There are some charms, a piece of ribbon, a short length of silver ball chain, some silver letters and some fancy buttons. This is another excellent noise maker and its fun to spy the items inside. 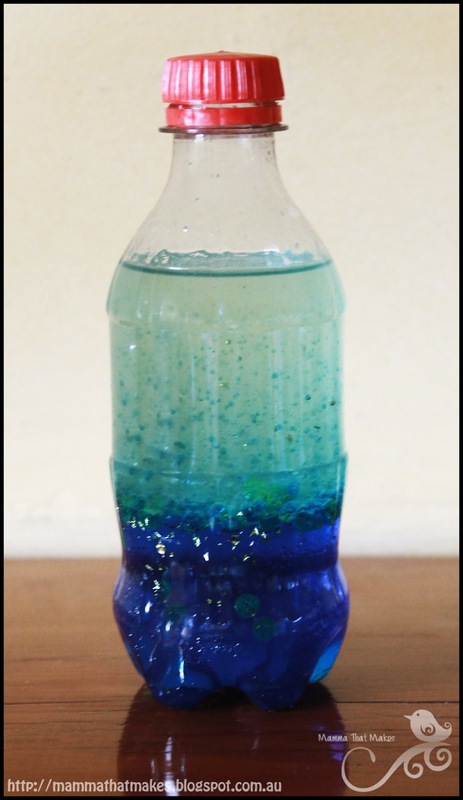 10: The ocean bottle. Ohh this one is such fun! It is roughly 1/2 sunflower oil, 1/4 water that was tinted blue and some space left for shaking fun. We also added some greenish coloured sequins that float between the layers. The girls like to go from making gentle waves to really shaking it to see everything foam up and then resettle. Thats it peeps! 10 super easy, super fun discovery bottles for little (and not so little) hands to play with. Everything in these came from my cupboards, I didn't purchase a thing... Well, aside from the coke but hey that doesn't count because I totally upcycled the bottles into something way fun! This will make a great shower gift idea. Thank you.